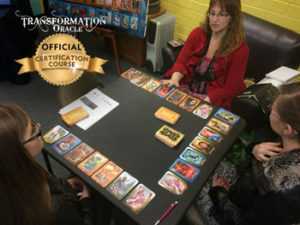 "The Transformation Oracle Weekend Intensive Workshop challenged me to look deeper into the meaning of each card and allow the messages from the Divine to Flow. I've never explored cards quite in this way before. Someone had once suggested to get to know each card one at a time, but it always seemed so daunting and like it would take forever. These assignments have allowed me to explore each of the cards in a deeper way. And it's not just the assignments, but also the phases of transformation and the elements. Thank you!"